Since the last two decades, Suryalakshmi Cotton has started denim cloth manufacturing as a forward integration strategy; it conducts cutting-edge research to design, engineer and produce specialty denim fabrics to meet the unique needs of global fashion markets. We have a state-of-the-art fully integrated fabric manufacturing facility in Ramtek (Nagpur, Maharashtra). With an installed capacity of 40 million meters per annum, we enable one of the highest per meter sales price realization in the industry. Our fabric development process starts with the customer. We custom-engineer a limitless combination of finish chemistries for diverse fabric needs. With the latest equipment for dyeing, weaving and finishing, we have provided over 3,000 different varieties of specialty fabrics to customers across the globe. 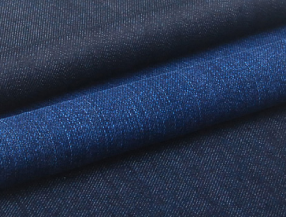 Our denim fabrics weigh from 5 oz to 15 oz, making them suitable for a wide variety of fashion wear. Our performance-oriented fabrics are specially designed keeping the end-use in mind. From light fabrics that are breathable & airy to a variety of denim blends that are meant to retain the shape and durability, our fabrics cater to diverse end-product needs. Our design and trending teams conduct ongoing trend research for internal product development of colors, grains and finish attributes. Our ability to create custom designs and innovations provides an infinite range of possibilities for our customers. Each and every product at Suryalakshmi Cotton undergoes rugged tests and stringent quality procedures to ensure high quality performance. With a commitment to sustainability, our products are created with a near zero environment impact, deploying safe & green technologies.